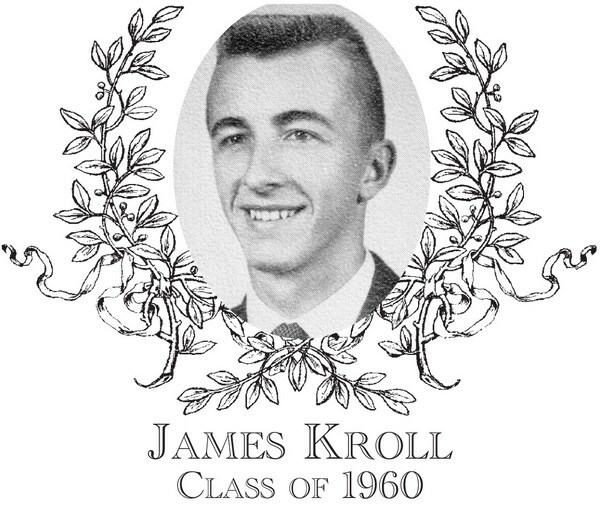 James Kroll, class of 1960, was an outstanding athlete at Bartlett High School, participating in basketball and baseball. In basketball, Jim lettered his junior and senior years. His role as the 6th man was instrumental to their success. The Webster Times wrote that he played so well, he could have been a starter his senior year on a team that finished at 17 and 2. As a junior, Jim led Bartlett with a lofty .447 batting average in baseball while pitching and playing left field. In his senior year, he batted .431 on a team that had four future Bartlett Hall of Fame members. His statistics that year included leading the team in hits, runs scored, and in stolen bases. His baseball coach, Sigmund Strzelecki, called Jim one of the best hitters he had ever coached. As a pitcher, Jim�s overall record was 12 wins and 0 losses, and he is believed to be the only Bartlett pitcher to win 3 successive games in one week. Following the season, Jim was awarded the MVP in baseball and he was chosen by the Webster Exchange Clubas its most valuable player. James Kroll enrolled at Southern Connecticut State College where he continued to excel on the diamond. While playing mostly Division I schools such as St. John�s and Delaware, Jim led the team in hitting in 1963 and 1964, and was chosen co-captain his senior year. He also played for Falmouth in the prestigious Cape Cod League, leading his team in hitting with a .401 batting average, and was selected to the Cape Cod All Star team. At the age of 22, Jim was appointed varsity baseball coach at Quinnipiac University, holding the unique distinction of being the youngest Division I college coach in the country. He coached Quinnipiac to the NAIA New England Championship the following year. During ensuing years, he served as the athletic director at the American School in the Dominican Republic, Southbridge High School, and ended his education career as principal at Bartlett from 1977 to 1988. In retirement, Jim has become an accomplished golfer once recording two successive holes-in-one in the same round, and he was a finalist in the US Senior Amateur golf Championship in 2012. Jim lives in Tequesta, Florida with his wife Paula and continues to enjoy playing golf, recording his 7th ace this past year.